The history of the Jewish community of Charlottesville shares much in common with the broad sweep of the Jewish experience in the South and throughout America. It is a story of colonial-era Sephardic Jews and of nineteenth-century immigrants first from Bavaria and Wurttemberg and then from Kovno and Minsk. It is a story of peddlers and merchants, and of involvement and leadership in local government, the arts and education. It is a story of the commitment of a few to the creation and maintenance of local civic and religious institutions. 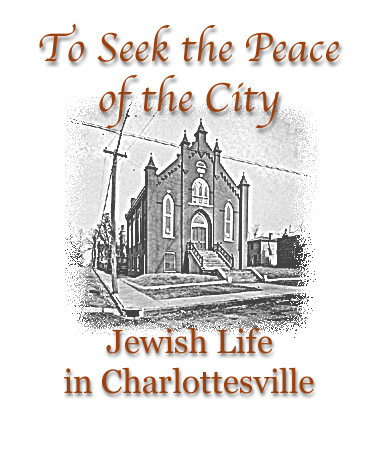 "'To seek the Peace of the City': Jewish Life in Charlottesville" was a program of the Jewish Arts and Culture Taskforce of the Hillel Jewish Center at the University of Virginia, in partnership with Congregation Beth Israel of Charlottesville and the Albemarle County Historical Society.